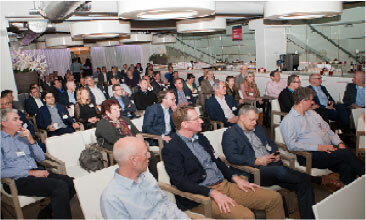 On March 9, 2017, the 6th “Food forThought” session (FFT) took place at the PSV Stadium in Eindhoven, aimed at knowledge sharing and networking for IT executives. The event is organized twice a year by the companies The Orchestrate Group (www.orchestrate-group.com) and Purple Square Management Partners (www.purplesqr.com). This time it was the theme of the session “Cultural change in ICT environments” with the subtitle “Anglo-Saxons and Rhinelanders meet each other on the battlefield”. 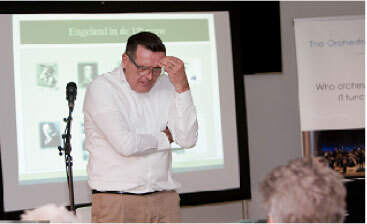 Jan Maenen and Jan Kloppers guided an audience of 80 IT executives through various battlefields of the 1st World War. This historical and military perspective was used to illustrate cultural and management style differences in how teams and organizations function. In addition, Louis Luijten, CIO at ASML, commented to the topic as a guest to the event. This way, theory and practice came together again in this FFT session. 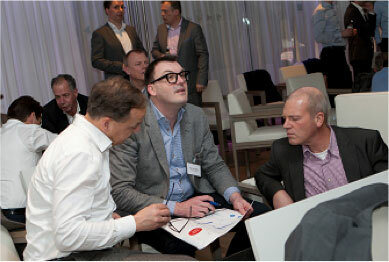 A total of 79 ICT managers attended the session in Eindhoven. The audience engaged in a lively discussion mirroring the presented theory to current day practices. Maenen and Kloppers elucidated on Sustainable Dynamic Change as a model for cultural change in modern organizations. Maenen and Kloppers first took the FFT attendees to the trenches of Beaumont-Hamel where in the First World War about 1500 Canadians and Irishmen took it against about 150 Germans. Under loud machine gun sounds, the attendees were invited to take decisions in groups of 3 during the advance of the Anglo-Saxons, seeking cover on the floor and behind the tilted tables. In the reality of 100 years ago, 80% of the Anglo-Saxons lost their lives within 30 minutes and the Germans were virtually unscathed. What was it that caused this disaster? The message: The history in England was characterized by more individualism, larger differences between rich and poor and an army in which executives were promoted based on origin and not so much based on knowledge and expertise. The Germans, on the other hand, put craftsmanship at the center. Soldiers were sent to the Kriegsschule several times and there was a stronger collective. After the key note presentations, a panel discussion took place based on challenging statements were used to make the audience reflect on the theme of the event. The event was closed with an informal drink, where the attendees discussed the topics with old acquaintances and new contacts. Food for Thought is organized twice a year. Check out our news page to see when the next Food for Thought will be held .